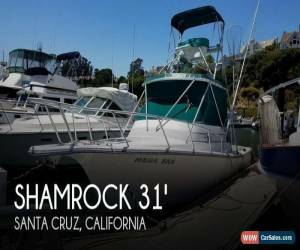 If you are in the market for sportfish yacht, look no further than this 1988 Shamrock 31 Grand Slam, just reduced to $58,500 (offers encouraged). 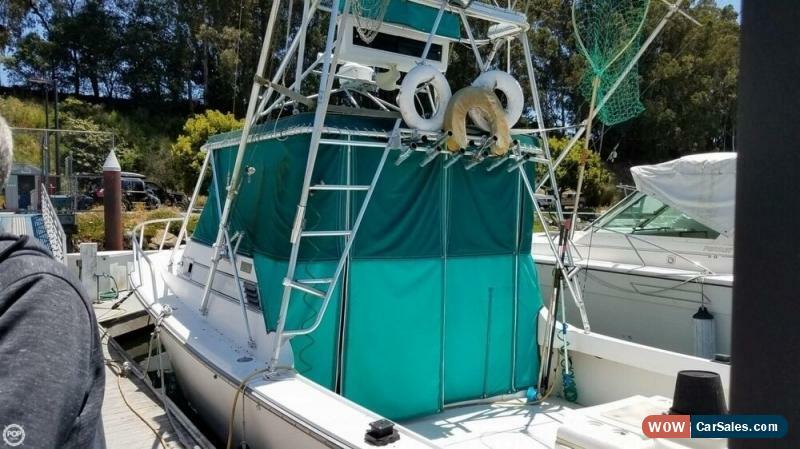 This boat is located in Santa Cruz, California and is in great condition. She is also equipped with twin Cummins engines that have 1,258 hours. Take look at ALL ***147 PICTURES*** of this vessel on our main website at 1988 Shamrock 31 Grand Slam. We appreciate that you took your time to look at our advertisement and we look forward to speaking with you! Options and Standard Features	Options		Cabin Fan: Included		Cabin Lighting: Included		Carpet: Included		Companionway: Included		Countertops: Wood Cutting Board Flush Over Sink In Galley		Galley: Included		Head: Included		Large Aft Deck: Included		Microwave: Included		Oven: Included		Port Holes: Included		Refrigerator: 2.1 Cubic Foot		Shower: Enclosed		Sink: Bathroom And Galley		Stove Oven: 2-Burner Seaward Princess Stove Electric Alcohol!!! 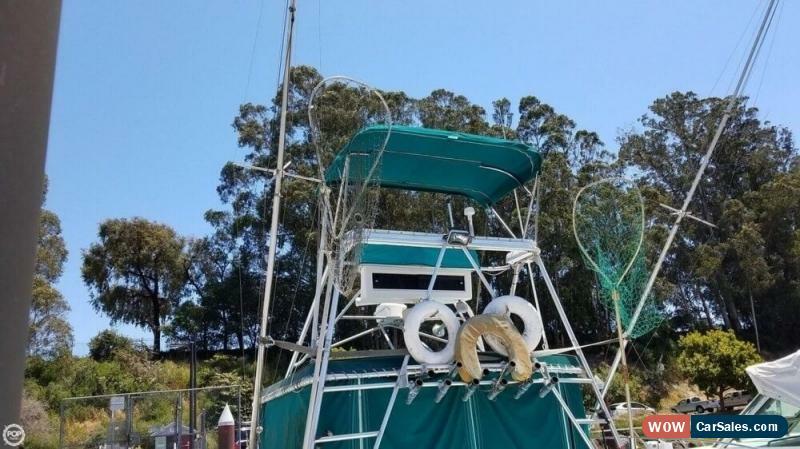 	Toilet Electric: 12Vdc Electric Macerating Head		V Berth: Included		Closed Transom: Included		Helm Console: Included		Upper Helm Station: 15'Tuna Tower		Anchor: Included		Bait Station: Included		Bait Well: 50 Gallon		Bow Rail: Included		Canvas: Complete Sunbrella Enclosure W/Clear Vinyl Windows		Captain's Chair: Included		Cleats: Included		Cockpit Seating: Included		Console Bait Well Seat: Included		Dock Lines: Included		Downrigger: Dual Cannon "Magnum 10" Electric		Fenders: Included		FULL CUSTOM ENCLOSURE: Canvas With Vinyl Windows		Hard Top: Included		Instrument Cover: Included		Live Well: Dual Fish Lockers P&S		Raw Water Washdown: Dual Wash-Down Pumps P&S		Rocket Launchers: Included		Rod Holders: Included		Steering Wheel: Included		Swim Platform: Included		Tackle Center: Large Built-In		Upper Helm: 15' Tuna Tower W/Steering/Shift-Throttles		Washdown: Included		Outriggers: Dual 20 Ft P&S		Alternator: High Output		Batteries: Included		Battery Charger: Included		Cockpit Lighting: Included		Courtesy Lights: Included		Engine Kill Switch: Included		Fuse Panel: Included		Galvanic Isolator: Included		Hour Meter: Included		House Batteries: Included		Ignition: Included		Interior Lighting: Included		Inverter: 1500Watt Xantrex W/Remote Display Auto Transfer Switch		Shore Power Cord: 30Amp		Speakers: Included		Speedometer: Included		Stereo: Included		Transom Storage Box: Included		Water Heater: Gallon, Dual 120Vac Engine Heat Exchanger		Zinc Anodes: Serviced 2X/Year		Bilge Pump: Included		Bottom Paint: Included		Deck Controls: Included		Engine Compartment: Mid-Ship		Engine Controls: Included		Exhaust: New Stainless Steel Fabricated Replaced 2016		Flybridge: Tuna Tower		Fuel Filters: Included		Fuel Tank: 300 Gallons !!! 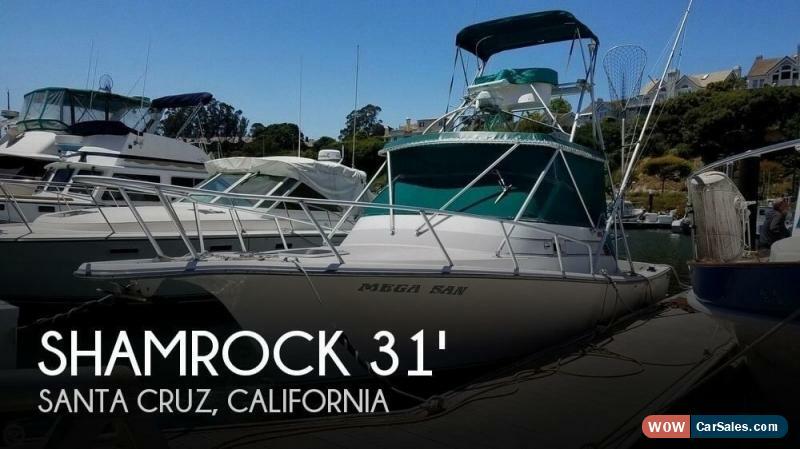 	Holding Tanks: 25 Gallon		Macerator: 12Vdc Macerating Pump-Out Of Holding Tank		Power Trim: Included		Steering: Hydraulic		Trim Tabs: Electric P&S		Water Tanks: 35 Gallon		Zinc: Serviced Twice/Year		Trolling Valves: P&S		Rudders: Included		Autopilot: Furuno Nav-Pilot W/Hydraulic Ram		Chartplotter: Furuno RDP-148 Multi Function Display		Fish Finder: Furuno FCV-582L 1Kw		GPS: Spare Garmin 128		VHF: Icom IC-M504 W/Gps Coordinates And DSC Calling		EPIRB: ACR Satellite2 406Mhz Class I		: NOTE: Radar Needs To Be Updated		Communications: Icom IC-M504		Fire Suppression System: Halon		Life Jackets: Included		Navigation Lights: Included	Basic Information	Year: 1988	Make: Shamrock	Model: 31 Grand Slam	Stock Number: 130042	Condition: Used	Type: Sport Fisherman	Use: Not Specified	Length Beam	Beam (Feet): 11	Length (Feet): 31	Hull Type	Hull Material: Fiberglass	Engine	Fuel Type: Diesel	Engine Make: Cummins	Engine Model: 6BT5.9-M Turbo	Engine Hours: 1258	Fuel Capacity	Fuel Capacity (Gallons): Over 200	Exterior	Color: White With Green Canvas	Convenience	Water Hold (Gallons): 35		Similar Vehicles	Check out similar vehicles in our inventory. View Inventory	Contact	Ask for:Sales Department	Contact:	Contact Us	Main:(941) 803-7098	Showroom Terms	We make every effort to present information that is accurate. However, it is based on data provided by the vehicle manufacturer and/or other sources and therefore exact configuration, color, specifications accessories should be used as guide only and are not guaranteed. We are not liable for any inaccuracies, claims or losses of any nature. Inventory is subject to prior sale and prices are subject to change without notice and cannot be combined with any other offer(s). The price for listed vehicles as equipped does not include other charges such as: License, Title, Registration Fees, State or Local Taxes, Smog Fees, Credit Investigation, Optional Credit Insurance, Physical Damage of Liability Insurance, Delivery Fees, Finance and/or Documentation Fees. Any and all differences must be addressed prior to the sale of this vehicle. Selling Vehicle? Create Professional Listings Fast and Easy. Click Here! Copyright © 2017 Auction123 All rights reserved. Disclaimer	Auction123 (a service and listing/software company) and the Seller has done his/her best to disclose the equipment/condition of this vehicle/purchase. However, Auction123 disclaims any warranty as to the accuracy or to the working condition of the vehicle/equipment listed. The purchaser or prospective purchaser should verify with the Seller the accuracy of all the information listed within this ad.